Cabarrus County is located just northeast of the city of Charlotte. As of 2012, it is estimated that 184,498 people live in the county. The county seat is Concord. It is known for being the site of the Reed Gold Mine, which contained some of the first gold mined in the United States. Cabarrus is associated with NASCAR and its county seat of Concord is the site of Charlotte Motor Speedway. Politically, Cabarrus is strongly Republican, though not as much as it used to be. Though the Religious Right is still powerful here, Cabarrus is changing from a rural county to more of an exurban county, with many residents moving in from other states. An influx of African American residents has contributed to increased support for Democrats in the county. 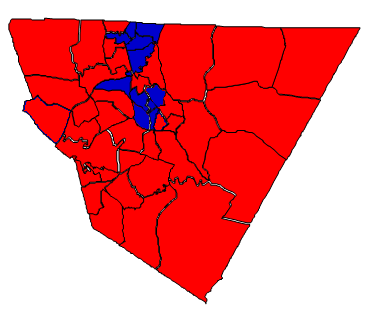 In 2012, Mitt Romney carried Cabarrus County with 59% of the vote. Pat McCrory vastly outperformed Romney, winning with 68% of the vote. Cabarrus votes Republican up and down the ballot, controlling the County Commission and having an all-Republican legislative delegation. In Congress, most of Cabarrus is in the 8th congressional district, represented by Republican Richard Hudson; three precincts are in the 12th congressional district and are represented by Mel Watt. Forecast: For the past twenty years, Cabarrus County has seen rapid growth. In particular, the growth of the African American population, and the mass registration of this group seen during the Obama election years, has caused a Democratic trend in Cabarrus. Hispanics are also on the rise in Cabarrus, now representing 9% of the population but much less in terms of registered voters. Whites, 83% of the population in 2000, now represent only 75% of the population, an 8-point decline. Romney won nearly three-quarters of the white vote in 2012; given the vast growth seen in the county research into the voting habits of migrants would be well-advised. Cabarrus is now the fastest-growing county in the Charlotte area, in terms of percentage growth of the population. Thus, Cabarrus is likely to play an even more prominent role in the political landscape. As one of the larger GOP counties, Republicans will need to continue to rack up large margins here in the future to win statewide.